Most historical places don’t start off intending to be historical, and the grand house at 201 Richardson Ave. is no different. Few people bothered to record much information about the house for the same reason most people don’t have much documentation on their own childhood homes. Based on stories and some small bit of paper evidence, the house was built sometime around 1903. There is a cement slab on the property with the date 1891 stamped into it, indicating it may have been in the works even before Artesia was officially Artesia! It may have arrived by train as a kit house from Montgomery Ward. Originally, it was occupied by Austrian immigrants Rick and Ann Schuster. It remained a privately-owned home until 1924, when the widow Rose Ferson turned it into a boarding house. The boarding house remained in business until the 1980s, when it began to fall into disrepair. The house was unsafe, falling apart, and should have been condemned and torn down long before Becky Crockett acquired it. Crockett, however, saw something that other people didn’t — a beautiful house, waiting to be restored, and she wanted to save it from demolition. “Everyone wanted it to be restored, but no one wanted to put in the work, so I did,” Crockett said. With the help of her contractors, she did just that. She never intended to make money on the building; she just wanted to give this great house back to the community. She took on the project against everyone’s advice, including, to some degree, her own husband. It turned out to be a much more arduous project than she intended. She kept the structure of the house identical to its former 1903 blueprints, so looking at the house now is like going back in time. The only change made to the structure of the house was the removal of a decrepit outdoor staircase for safety reasons. Anything that could be safely kept original was repaired rather than replaced. Inside, the second story had completely collapsed into the first story. The recovered flooring was used to repair the original flooring in the other parts of the house. Scripture was written inside the walls and doorways before the sheet rock went up, left there as a blessing by Crockett. The flooring is the same as it was over a hundred years ago. Crockett was overjoyed when the current owners, Stephanie Jones and Renee Pinson, wanted the house. They had a vision for the old house even before it was renovated. They saw a wonderful place for healing and wellness. The current vision for the beautiful building is a wellness clinic with some fantastic ideas for a community outreach center in the back. The clinic officially opened Sept. 17 and is now taking appointments. Customers may even get to see some of the finer details of this beautiful building. 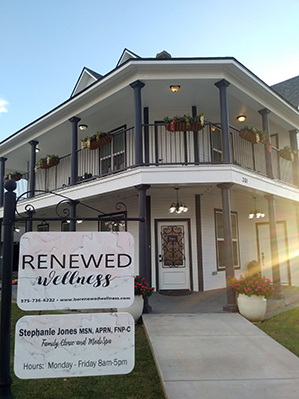 Besides being a family clinic, Renewed Wellness is one of only five certified menopause practitioners in New Mexico. It is the only one within 100 miles. They also feature a medispa, with numerous cosmetic procedures, all with the focus of health and wellness. 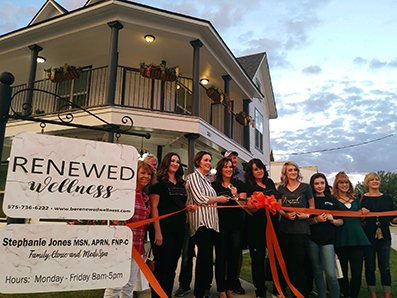 Jones and Pinson hope to grow Renewed Wellness into a center for the community and give back everything that was put into the elegant relic of the past. “The dream is bigger than what you see,” Pinson told me, and what I saw was gigantic.